Sometimes, this student of nature, just can't stick with her well- intentioned daily 'to do' list. But, how often do you run across a brave anole, that could give a rip about you being a zillion times bigger than he is, and just continues hunting bugs 2 inches from your toes? I ask you!?! 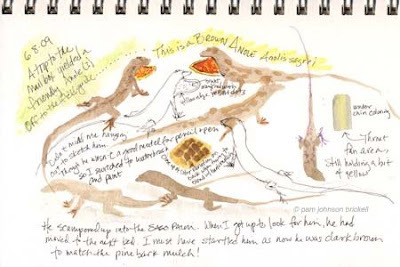 Of course, I had the best observations of the anole on my initial trip to the mail box. I think it's time to purchase a very small moleskin sketchbook to keep in my pocket! I grew up in New Orleans. Lizards abounded all over our yard. We do not have many lizards in Tennessee. We do have the Blue-tailed Skink, very elusive critter. I miss the lizards of my youth. When we went to Puerto Rico, they were everywehre. I must get out my photos and draw some of them. I enjoyed your story about trying to have your brush catch up with "him."